We are coming to a close on our basement remodel. Over the last 5 weeks we have spent a lot of time picking out finishing touches and details. One of my favorites is the wallpaper from Milton & King that I chose to use as a back-splash in my new laundry room as well as the feature wall in the new bathroom. Our basement includes 3 "wet" areas as our contractor kept referring to them. LOL He was referring to the kitchenette, the bathroom and then our laundry room/craft room. We have chosen to install counter tops in each of these areas and therefor would need a back-splash. In an effort to save money, I was trying to think outside of the box when it came to the material we would use. However, I did not want to forgo style just for the sake of the budget. 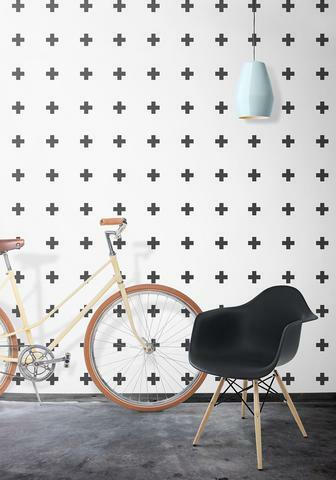 I came across Milton & King Wallpaper company via Instagram and immediately fell in love! They offer so many styles and prints to choose from! The boxes below are my 4 favorite black and white papers, click any image to shop! After I decided on "Tile Progress", I couldn't wait for it to arrive in the mail! It was beautifully packaged and I had to lay it out with my other design choices right away! At this point, I was still waiting for drywall to finish up before I could hang the beautiful paper. I was very pleased with the feel of it in person. Now, I would not consider myself a professional wallpaper"er" by any means! I have however hung wall paper many times in the past. I have used both pre-pasted as well as non-pasted. The wall paper from Milton & King does require a separate paste or wall paper glue to be applied using a brush or roller. I can say there are pro's and con's to each method. Once I received the all clear from the drywall guys, I got to work! I was very pleased with how smoothly the hanging process went. Definitely follow the instructions as stated by Milton & King, they even have a handy video for more details. The Tile Progress pattern that I chose, made butting the seams together very easy for a seamless match! I hung the paper in place of a back-splash in our laundry/craft room space, as well as on the sink wall of the bathroom. I was even receiving compliments from the contractors when they saw it! After this photo was taken, I ended up adding the paper to the wall where the sink wraps around the corner. It just felt like it was supposed to be there, a real tile back-splash would be after all! I also hung this paper in the bathroom, and I know I took a quick photo when it was complete, but I can not for the life of me find it anywhere on my computer! So that just means, you'll have to come back and join me for the final basement design reveal post! As I write this post today, the last of the contractors is wrapping up and cleaning up their messes! I will take some time to decorate and then I'll be shooting the photos for the final reveal! I can not wait to share it with you all! Stay tuned!